For us, the Religious of Our Lady of Sion, Jerusalem is the indispensable source of our vocation. The main purpose of our presence in Jerusalem is the formation of the members of our congregation: they come to us for a more or less extended period of formation. Over a short period, the formation consists, on the one hand, in a general initiation to the Jewish world, whereby its importance for Christian faith is emphasized, and on the other hand, in getting to know the land of Israel. Formation over a longer period includes an introduction to Judaism with the aim of getting to know it better through contact with the Jewish people in its own land. In addition, Hebrew is studied. This program of study is implemented by the Brothers and the Sisters of Sion in collaboration with our Jewish friends. For those who progress sufficiently, this formation can be followed by courses at the Hebrew University of Jerusalem. 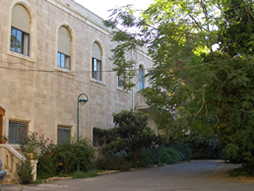 Some of us have been able to plan their program of study so as to include theological formation at Catholic university institutions in Jerusalem.